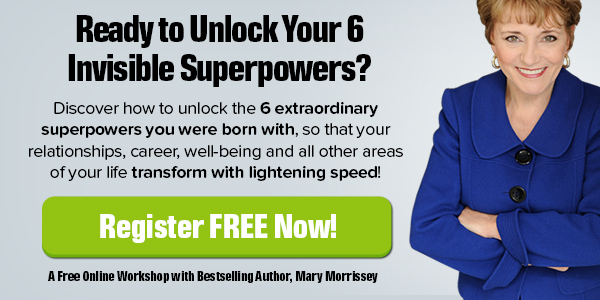 Unlocking Your 6 Extraordinary Superpowers... Workshop! At a very early age, we are taught that we have 5 senses – taste, smell, touch, sight and hearing. Most of us grow up believing that these are the only senses we have to work with when it comes to making sense of the world, and creating the results we desire in life. In case you don’t know of Mary Morrissey, she’s a bestselling author, speaker and coach who, through her books, live events and online programs, has helped MILLIONS of people worldwide create a life they truly love living. And, she’s also a good friend of mine! According to Mary, in addition to our 5 senses, each one of us is actually born with 6 invisible superpowers that work on an energetic level to help shape our reality. Unfortunately, most of us are UNAWARE of what these 6 superpowers are. We use them daily, but often UNCONSCIOUSLY… and when we do this, we generate a lot of unnecessary stress, scarcity and struggle in life. But, once you learn how to CONSCIOUSLY harness these superpowers, your relationships, career, business, health and all other areas of your life will transform with lightening speed! Mary is holding this online workshop several times over the next few days, so it’ll be easy to find a date and time that works best for you!